Review by Olorin on 5/20/2012. I like all of the state maps it lets you learn a little about the state's geography. 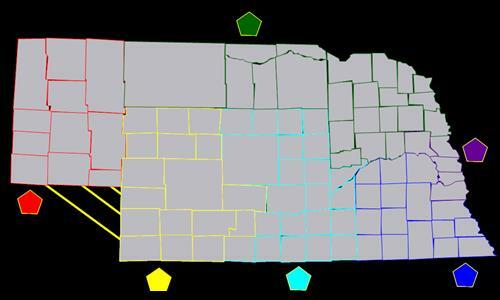 These state maps are typically best for a quick game for a few people, this is true of the Nebraska counties. The best strategy to me is to have the east it is a small bonus but the most manageable to obtain. Review by dodo comander on 5/20/2012. This map does not propose many strategies it is rather strait forward. I find you could have added 2 or 3 smaller bonus to make it more playable. As it is now you don’t have any bonus supporting your bigger ones. I find this map to be sloppy, for I see gaps between territories and bonus.